8-4.1 MK 3 MOD 0 Lightweight Dive System (LWDS). The MK 3 MOD 0 LWDS is a portable, self-contained, surface-supplied diver life-support system (DLSS). The MK 3 MOD 0 LWDS can be arranged in three different configurations and may be deployed pierside or from a variety of support platforms. 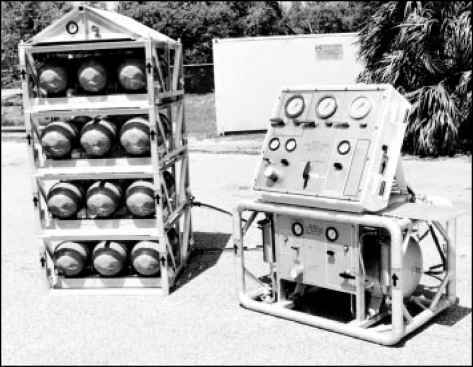 Each LWDS includes a control console assembly, volume tank assembly, medium-pressure air compressor (optional), and stackable compressed-air rack assemblies, each consisting of three high-pressure composite flasks (0.97 cu ft floodable volume each). Each flask holds 198 scf of compressed air at 3,000 psi. The MK 3 MOD 0 LWDS provides sufficient air for two working divers and one standby diver operating at a moderately heavy work rate to a maximum depth of 60 fsw in configuration 1, 130 fsw in configuration 2, and 190 fsw in configuration 3. The MK 3 MOD 0 will support diving operations with both UBA MK 20 MOD 0 and UBA MK 21 Mod 1. Set-up and operating procedures for the LWDS are found in the Operating and Maintenance Instructions for Lightweight Dive System (LWDS) MK 3 MOD 0, SS500-HK-MMO-010. 8-4.1.1 MK 3 MOD 0 Configuration 1. Air is supplied by a medium-pressure diesel-driven compressor unit supplying primary air to the divers at 18 standard cubic feet per minute (scfm) with secondary air being supplied by one air-rack assembly. Total available secondary air is 594 scf. See Figure 8-3. 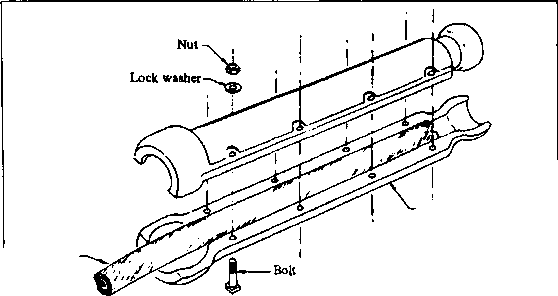 Figure 8-3. MK 3 MOD 0 Configuration 1. 8-4.1.2 MK 3 MOD 0 Configuration 2. 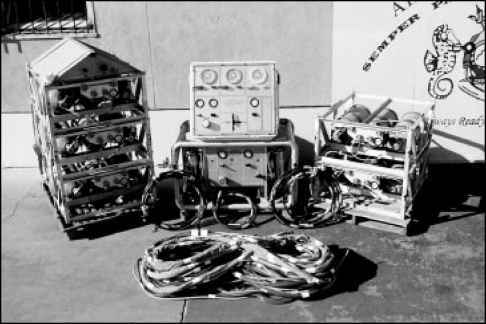 Primary air is supplied to the divers using three flask rack assemblies. Secondary air is supplied by one flask rack assembly. Total available primary air is 1782 scf at 3,000 psi. Total available secondary air is 594 scf. See Figure 8-4. 8-4.1.3 MK 3 MOD 0 Configuration 3. Primary air is supplied to the divers using three flask rack assemblies. Secondary air is supplied by two flask rack assemblies. Total available primary air is 1,782 scf. Total available secondary air is 1,188 scf. See Figure 8-5. 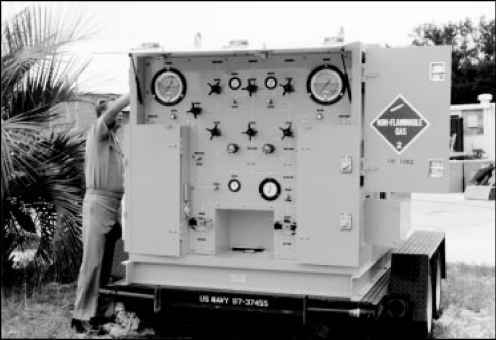 MOD 0 LWDS except that the control console and volume tank have been modified to support 5,000 psi operations for use with the Flyaway Dive System (FADS) III. With appropriate adapters the system can still be used to support normal LWDS operations. See Figure 8-6. Figure 8-4. MK 3 MOD 0 Configuration 2. Figure 8-5. MK 3 MOD 0 Configuration 3. Figure 8-6. MK 3 MOD 1 Lightweight Dive System. Diving control station. A single operator controls and monitors the air supply and operates the communication system. ■ Power distribution system. External power for communications and control station lighting. ■ Intercommunication system (AC/DC). Provides communications between divers and the diving control station. ■ Air supply system. Primary air source of two 6 cu ft, 3,000 psi air flasks; secondary air source of a single 1.52 cu ft, 3,000 psi air flask; and a scuba charging station. Detailed information and operating instructions are covered in Operations and Maintenance Instructions for Ready Operational Pierside Emergency Repair (ROPER) Diving Cart, SS500-AS-MMA-010. 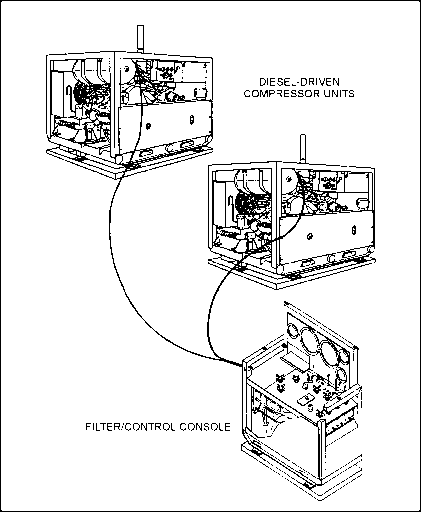 consists of a filter control console (FCC) intended for use with the medium-pressure flyaway air compressors and/or conventional air supplies. In its present configuration, the system can service up to four divers depending on the diving equipment in use. MK 21 MOD 1 and MK 20 equipment may be employed with the FADS I. See Figure 8-8. Operational instructions for FADS I and II are covered in Fly Away Diving System Filter/Console Operation and Maintenance Instructions, S9592-AD-MMM.FLTR CONT CSL; Fly Away Diving System Compressor Model 5120 Operation and Maintenance Instructions, S9592-AE-MMM-0W/MOD 5120; and Fly Away Diving System Diesel Driven Compressor Unit Ex 32 Mod 0, PN 5020559, Operation and Maintenance Instructions, S9592-A C-MMM-010/Detroit DSL 3-53. ■ Diving outfit. Four demand helmet (MK 21 MOD 1) assemblies with umbili-cals, communication system, tool kit, and repair parts kit. ■ Two medium-pressure air compressors (MPAC). Diesel-driven QUINCY 250 psi, 87 standard cubic feet per minute (scfm), skid mounted. Figure 8-8. Flyaway Air Diving System (FADS) I. ■ High pressure air compressor (HPAC). Diesel-driven INGERSOLL RAND 10T2, 3,000 psi, 15 scfm, skid-mounted. ■ Filter control console. Regulates and filters air from MPAC, HPAC, or HP banks to support four divers, skid-mounted. ■ Suitcase filter control console. Filters MPAC air to support three divers. ■ Double-lock aluminum recompression chamber. 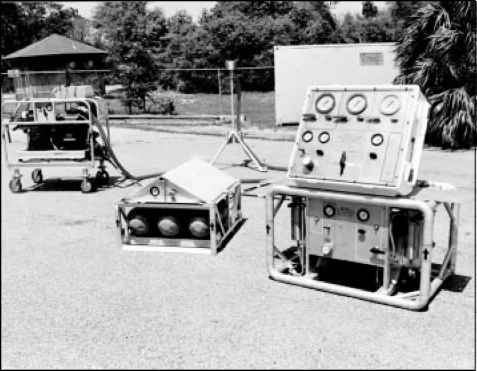 Standard USN chamber, skid-mounted and designed to interface with filter control console. ■ Two HP air banks. Two sets of HP banks providing secondary diver and chamber air. ■ HP oxygen tank. One bank of HP oxygen providing chamber support. ■ 5 kW diesel generator. Provides power for communications, chamber lighting, miscellaneous. ■ 5 kW diesel light tower. Provides power to tripod lights, mast lights, underwater lights. ■ Hydraulic tool package and underwater lights. As required. ■ Equipment shelter. 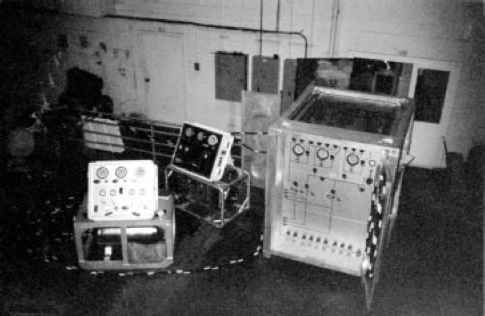 Fiberglass container houses filter control console and diving station. ■ Two conex boxes. Steel containers for equipments storage. 8-4.6 Flyaway Dive System (FADS) III. ASRA to provide primary and secondary air to the divers as well as air to support chamber operations. Set-up and operating procedures for the FADS III are found in the Operating and Maintenance Technical Manual for Fly Away Dive System (FADS) III Air System, S9592-B1-MMO-010.